Gauguin’s return to Paris from his first stay in Tahiti in August 1893 did not go quite as he had hoped: no fanfare, no hero’s welcome, and most disappointingly of all no sales. Despite some critical interest in his work, success still seemed to elude him. What was more, after years of support, his wife Mette cut off any ties with him. Broke and without a family, he went to Brittany where living costs were cheaper, but readjusting to life in “civilized” France proved a challenge. A drunken brawl with a bunch of Breton sailors shattered his ankle, an injury from which he would never completely recover. Enough was enough, apparently. In June 1895 he departed for Tahiti never to return. It is in this tempestuous period that he produced arguably his masterpiece in the medium of ceramics: Oviri. From wood-carvings and ceramics to highly finished marble works, sculpture was integral to Gauguin’s artistic practice. 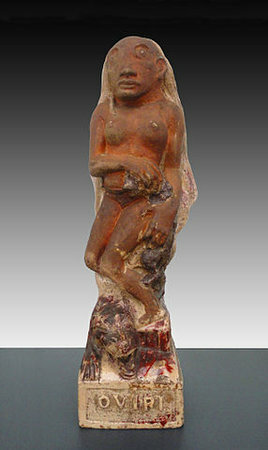 His works in clay, all produced in Paris in the mid-80’s to the mid-90’s, owe much to the great ceramist Ernest Chaplet who offered Gauguin assistance in firing and glazing as well as access to his kiln in Rue Blomet, Montparnasse. Oviri was the largest and the last of these series. Ceramics appealed to him for several reasons; the first was financial, not only is clay cheap, but given its practical usages, Gauguin hoped, misguidedly as it turned out, that his pottery would attract more buyers than his painting. Then there was his famous love of non-European art, such as the Inca and pre-Columbian pottery he encountered in his Peruvian childhood. Gauguin viewed such works—both decorative and utilitarian—as capable of expressing profound emotions as much so-called high art, hence the term “art pottery” he used to describe them. Gauguin was not entirely alone in wishing to elevate this humble medium. Towards the end of the nineteenth century there was a noticeable crumbling of the hierarchies that had separated the fine artist from the craftsman, the distinction say between the liberal and the mechanical artist which had held sway since the Renaissance. 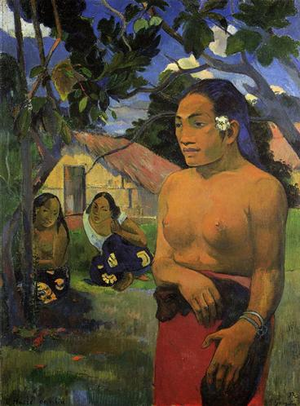 In Tahitian culture there were no such fine distinctions, instead, the craftsman/artist was defined quite differently, as Gauguin came to discover, being neither warrior/hunter nor homemaker/carer, over there he was neither fully male nor fully female but occupied, socially speaking, an androgynous middle ground somewhere between the two. This ambiguous sense of gendered identity appealed to Gauguin’s subversive spirit. Certainly the creative potential of androgyny intrigued him and is often commented on in discussions of Oviri. A shortened form of Oviri-moe-aihere (the savage who sleeps in the wild forest), the Tahitian goddess of death and mourning, the name itself fascinated Gauguin: savage, brutal, bloodthirsty. He used it, like a nom de guerre, to refer to himself, as though taking on the goddess’s terrible aspects. 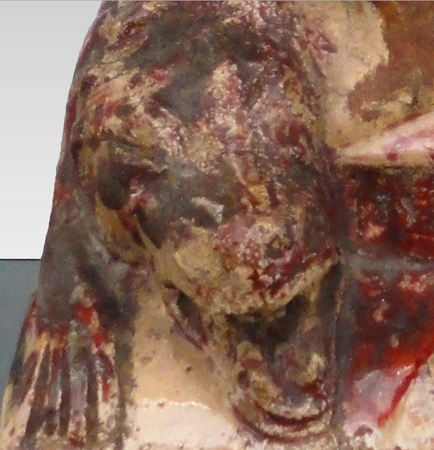 Here she stands, then: under her feet a dead she-wolf; in her hands the crushed form of its cub; the red glaze suggestive of the trickling flow of their blood. There is no known source for the episode, which was probably Gauguin’s invention. This left the way open for various interpretations: that the wolves represent the savagery of the goddess herself; that by killing them she is somehow absorbing their violent capabilities; even that they are Gauguin himself. In a number of letters he draws the comparison, recalling, for instance, how Degas once described him as “the hungry wolf without a collar.” Others see a veiled allusion to the practice of infanticide, outlawed by the time of Gauguin’s arrival, that was carried out by the Areoi, Tahiti’s priestly elite. 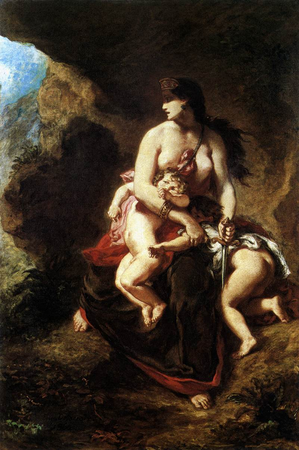 The image evokes notions of sacrifice or perhaps stories of the vengeful mother archetype, drawing connections between Oviri and Delacroix’s Medea About to Kill Her Children of 1838. Whatever story it tells, its earliest manifestations in terms of design can be traced to a work produced two years earlier during his first stay in Tahiti, Where Are You Going? It is here, in the stocky, sculptural and distinctly androgynous frame of the foreground figure, carrying in her arms a wolf-cub that we get our first glimpse of Oviri. How different the ceramic is to the painting, though. 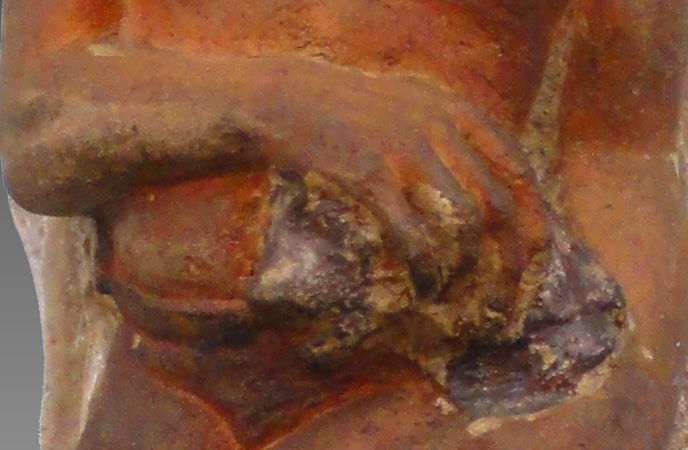 Perhaps due to the personal crisis that he experienced on his return to Paris or perhaps due to the medium itself with its direct contact between hand and clay. Oviri is a far more radical departure, an atavistic assault on the canons of grace, harmony and beauty. Ugly seems hardly adequate to describe this twisted and condensed avatar of primal, destructive forces, the huge goggle eyes floating inhumanly around her disproportioned head. 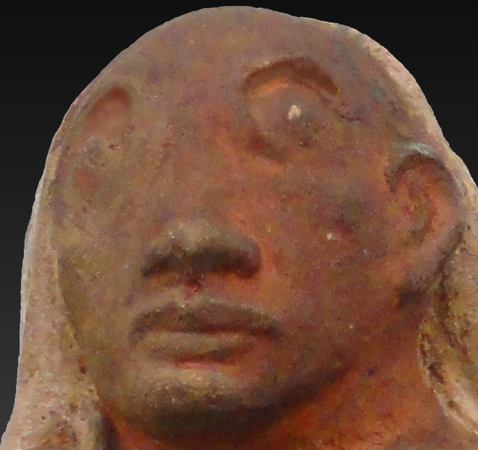 The block-like figure, lacking any piercings or projecting parts, like Egyptian statuary, commands a frontal view. When seen from the back, though, we are presented with a wholly different image, another work of art almost. What had looked from the front to be hair appears now as a cocoon-like covering, the chrysalis underneath, incipient, on the point of breaking out. The contrast with Oviri, the murderess, is striking. From this angle, the work also bears a striking likeness to Rodin’s Balzac, a sculpture he had been working on since 1891. Although not exhibited publicly until 1898, Gauguin certainly knew of the commission and perhaps was aware of the direction Rodin was taking with it. In both works we find the same dramatic reduction of form, rejecting any reference to the classical past, tapping instead into a more primordial impulse, in Oviri’s case a force at once female and male, in which the destructive, death-wielding act of crushing the wolf-cub finds its creative, life-giving antithesis in the organic, bud-like form of its reverse. It was this confounding of the ultimate boundary, that between death and life, that might well have prompted Gauguin in 1900, knowing that he had not long to live, to ask a friend to send him his Oviri from Paris intending it for his tombstone. His friend never got round to it; a merciful oversight given the stoneware would not have weathered well in that tropical climate. Instead it went on to feature in the artist’s retrospective of 1906, an exhibition Picasso saw and most probably drew inspiration from when composing his Les Demoiselles d’Avignon. In 1978, a bronze cast was made of the sculpture, which was placed before Gauguin’s grave in the Marquesas. Acknowledged as a masterpiece, in 1987 the original entered the collection of the Musée d’Orsay. Cite this page as: Ben Pollitt, "Paul Gauguin, Oviri," in Smarthistory, August 9, 2015, accessed April 21, 2019, https://smarthistory.org/gauguin-oviri/.